We're approaching the time of year that my Crock-Pot is going to start getting a workout! The days are getting shorter, the temperatures are getting colder, and our schedules are getting busy with holiday preparations, events, work schedules, etc. 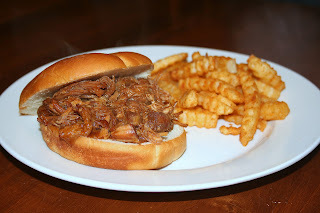 I have a few recipes that I love to make this time of year in my crock-pot, which I plan on posting soon, but one of my new favorites is this Pulled Pork I saw on Chaos in the Kitchen a few months ago. 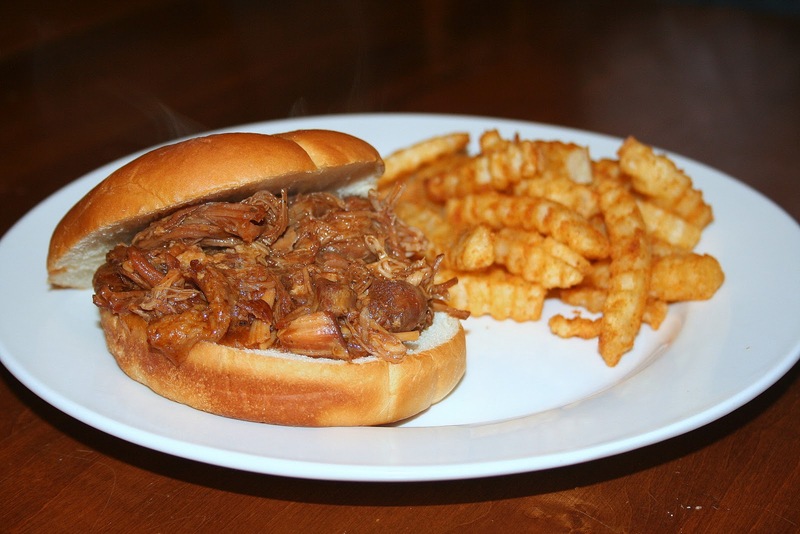 This pork is tender, juicy and meaty - perfect for pulled pork sandwiches. With just a little bit of prep required (searing the meat) the crock-pot really does most of the work for you. Because this makes a large portion, this recipe is also great for serving a crowd, or to freeze for an even quicker meal when you're really rushing to get dinner on the table. To freeze - prepare completely and then portion what you want to freeze in freezer weight ziplock bags or reusable containers (I like to freeze 2-3 portions per freezer bag). Thaw out in fridge overnight and reheat in microwave until heated through. Sprinkle pork with S&P. Heat oil over medium heat in a large heavy pot or dutch oven. Sear pork shoulder pieces a few at a time until all sides are browned and caramelized. Add pork to a slow cooker as they finish. Pour soda over pork and turn slow cooker to low and cook 8-20 hours. To serve, use two forks to slightly shred meat leaving some larger pieces. Split buns or dinner rolls and lightly toast. Toss each serving with a little BBQ sauce just to moisten. Nutella is something that I love, but honestly don't really eat or bake with that often, always regretting that fact each time I eat something with Nutella. Well, I am vowing to change my ways - starting with these Cannolis! They're definitely not a traditional cannoli as the combination of cream cheese and whipped cream make them more like a cheesecake filling, or even mousse, but the cannoli shell makes them easy to grab and eat. No fork required - my kind of dessert! Usually I prefer to make mini cannolis because sometimes full ones are just too rich for me, however any recipe could easily be adapted to a regular cannoli shell size (or mini size if the case may be). The combination of the cream cheese, whipped cream and Nutella definitely made these a rich bite-size dessert, that I think may become one of my go-to recipes when I need to make something quick and impressive. I'm from St. Louis. The home of Gooey Butter Cake. Many people think it's a Paula Deen creation, and how could you not when you see how much butter is in it, but you can't go in to a restaurant, bakery or grocery store without seeing gooey butter somewhere in St. Louis. We love it. What's not to love with butter, cream cheese, powdered sugar, oh my! But, considering I've made it numerous times, I'm always up for a new variation. Nutella? Check! Cookies? Don't mind if I do! Pumpkin? Well of course! While talking to my mom about what to bring to a family function, she mentioned she saw a recipe for key lime gooey butter cake. Sold! I've never heard of the website she sent over to me, but it looked similar to the basics of every other recipe I've used for Gooey Butter Cake so I knew I wanted to give it a try! This is a story I've been wanting to share for several years, in fact one of the reasons I decided to make the switch to more of a life blog versus a food blog. So bear with me here! I have two children. I tried breastfeeding both of them, and was unsuccessful with both, for different reasons. One wouldn't latch. One my supply was too fast and plentiful. I tried a few things because I really really wanted to breastfeed, but it was stressing me out, so I looked in to other options, which is where I learned about exclusive pumping.